A packed audience of 120 guests in the Terrace Pavilion of the House of Commons gathered to celebrate World IP Day on 26th April 2016. They were addressed by Baroness Lucy Neville-Rolfe, the Minister of IP, Dr Paolo Aversa, Lecturer in Strategy at Cass Business School, Dr Anthony Tridico, Managing Partner of Finnegan Europe, and John P Ogier, Director and Vice-Chair of IPAN with the theme of IP in the Fast Lane. Following the short presentations and a Q&A session informal discussions and networking continued in the relaxed surrounding of the Terrace Pavilion over drinks and canapés. Video produced in association with Ideas Matter, whose assistance is gratefully acknowledged. Over the past six years the IPAN event has helped spread the significance of intellectual property to UK plc through what is probably the largest and most significant World IP Day occasion in the UK. 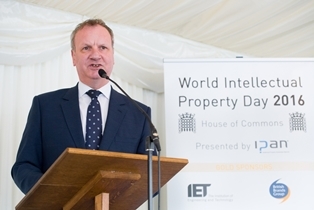 IPAN’s sixth celebration of World IP Day was again held in the Terrace Pavilion of the House of Commons on 26 April 2016 at the invitation of Pete Wishart MP, Chair of the All Party Group on Intellectual Property. It was attended by 120 guests including members of both Houses of Parliament, senior IP professionals and policy makers and major users of the IP system. This annual event helps to promote the importance of IP to the future economy in the UK. This year’s theme was “IP in the fast lane” and illustrated how IP is contributing to business sectors and economic growth. 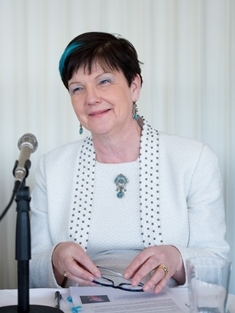 The key-note speaker was Baroness Lucy Neville-Rolfe, Minister for Intellectual Property. The process of digitisation has transformed the world around us at a furious pace. It has revolutionised the way we work; the way we interact; and the way we shop. Also joining her as speakers were Dr Paolo Aversa of Cass Business School, Dr Anthony Tridico of Finnegan Europe and John Ogier, IP economist and vice-chair of IPAN. In a high speed history of Formula 1, Dr Aversa, a leading expert in the intersection of innovation, business models and competitive strategy, reminded us that the death of Ayrton Senna in 1994 stimulated serious development to improve safety, resulting in a 20 year period without fatalities. At the same time, significant knowledge transfer from the racetrack to the outside world has occurred – the London Burns Unit uses technology developed by Williams, while sick children are monitored using diagnostic aids developed by McLaren. Big data analysis has been much improved from experience derived from F1, and on the product side there were serious contributions to the equipment used by competitors in the London Olympics. Although the Formula 1 business faces continuing challenges, particularly in governance, Dr Aversa is confident that it will continue to develop, make inventions, transfer technology and, of course, entertain. Dr Tridico spoke from his substantial US and European experience of advising on IP matters connected with rapidly developing technologies. Intellectual capital is recognized as the most important asset of many of the world’s largest and most powerful companies as well as the life blood of start-ups and SMEs. The importance of IP to the economy of the UK, Europe and the world is difficult to overstate. Those sectors that rely on IP rights demonstrate disproportionate amounts of growth compared to other industries, particularly industries working with “fast moving” technologies such as those in Formula 1, biotechnology and the like. The increasing challenge is for IP law to keep pace with the changes required to adequately protect these technologies that have become so vital to our economic growth. Our obligation as users of IP rights and practitioners of the IP system is to make our voices heard in the public discourse about the underlying economic importance of IP and to lend our expertise and experience to those effecting the law and policy. Only by developing, adapting and applying new market mechanisms for IP assets will it be possible to offer IP-rich companies the financial support they need to expand their businesses and thereby improve economic growth. To meet the challenge and realise the opportunity of the 21st century economy we have got to change the engine of the economic machine itself. All the key players from industry, financial services, professional bodies, educational establishments, government and international organizations will have to pull together and apply their respective skills and resources to realize this potential for economic growth, public good and competitive advantage. After the short presentations and Q&A (including the inevitable question about the impact of Brexit on IP in the UK), the 120 or so participants continued discussions informally over canapés and drinks. This year the IP Event was organised for the IPAN board by Roland Hill, convenor of the IPAN Parliamentary Group, assisted by Contra Vision and CIPA staff. 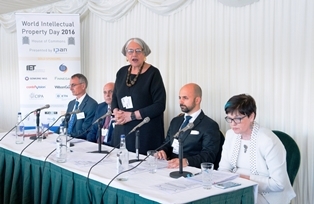 Professor Ruth Soetendorp, Chair, Intellectual Property Awareness Network and Associate Director, Centre for IP Policy & Management, Bournemouth University and IPAN Chair, who welcomed guests and introduced the panel of invited speakers.